A periauger was a wooden boat created by digging out a log, then splitting it longitudinally and adding at least one keel plank between the halves. The keel plank improved stability and increased cargo capacity without increasing draft. 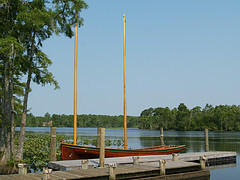 Unlike in other places, the term in North Carolina refers to a hull type rather than a rig and was first noted as a distinct North Carolina boat style by John Lawson in 1701. Powered by oars or sails and featuring two unstayed masts without headsails, it was a popular vessel throughout Tidewater North Carolina and Virginia until around 1880, when it was replaced by the sharpie and the V-shaped deadrise shad boat. A replica was completed in Beaufort in 2004 and sailed to Hertford in the "Periauger Odyssey." The dugout boat known in North Carolina as the "periauger" has gone by other names with similar spellings. Colonial South Carolina knew the dugout boat as the "periagua", a spelling originating from the Spanish piragua (derived from the Carib language). In French the boat was known as the "perogue", also likely derived from "piragua." In their journals of the explorations of the Corps of Discovery (1803-1806), Merriwether Lewis and William Clark frequently referred to their use of the perogue. Harry Pecorelli, Michael Alford, and Lawrence E. Babits, A Working Definition of "Periauger" (1996). "Periagua." South Carolina Encyclopedia, http://www.scencyclopedia.org/sce/entries/periagua/. "18th Century Replica, Periauger sits quietly at the Civic Center in Hertford, NC." Image courtesy of Flickr user Tim Gilliam. Available from http://www.flickr.com/photos/gilliamhome/204492104/ (accessed August 8, 2012). Hey Larry! Nice capsul job! !